Today is the final instalment of my 2016 favourites and I had to make it about blogs. I read them on a daily basis and they have overtaken my love of magazines so it makes sense that I share my favourites. Out of all of my favourites posts, this was the most difficult to compile because I read a large number of blogs but after a lot of narrowing down, I have my top 10 here today. Some I have read for a few years and some were discoveries this year but all are favourites for a variety of reasons! 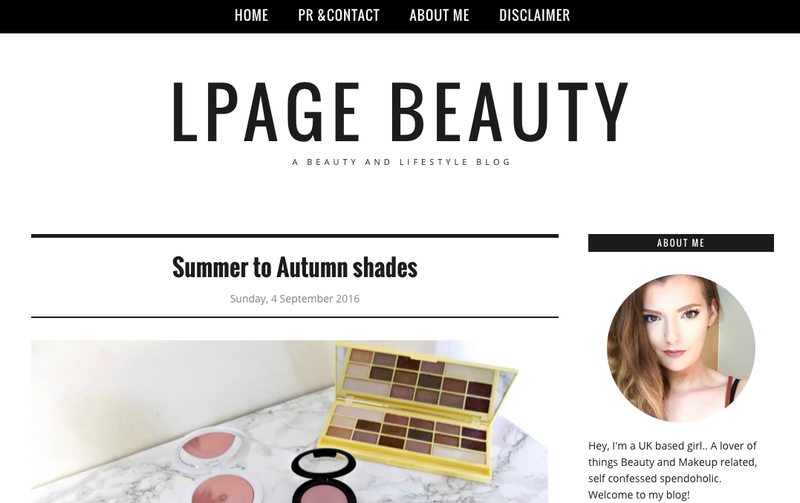 First up is Lpagebeauty! Leanne's blog is packed with up to date content, ranging from budget beauty hauls to high end reviews. I doubt that there is a product in Boots that she hasn't tried and her hair is to die for! She is also searingly honest in her reviews, which I love. If you don't follow her already, then you're missing out! I love to keep up to date with Leah's blog Devoted to Pink. Her content ranges from beauty to fashion to lifestyle - all equally as enjoyable as each other. Her photography is stunning and her writing is so engaging that I feel as though I know her. The lovely Dorota writes Idorottka, which is a makeup and skincare blog that features both high end and budget friendly products. Her photos are beautiful and I seriously don't understand why this lady doesn't have a larger following on Bloglovin! Go follow her, you will love her blog! I'm sure you all know Sally from TheMakeUp Directory! Although her blog name suggests she just writes about makeup, her content is far more varied than that! She posts brilliant, practical blog tips, makeup and skincare reviews, lifestyle posts and, more recently, travel reviews. Her Italy travel diary is one of the best I have read - I felt like I was there with her! 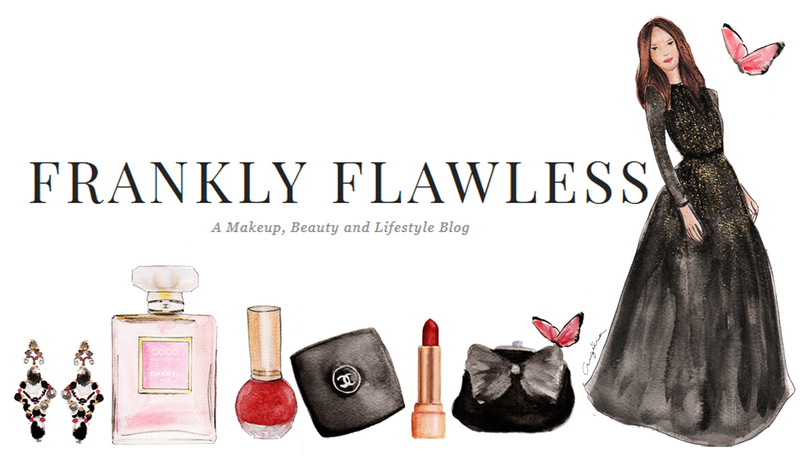 Frankly Flawless is written by Sabiha and her imagery is second to none. Everything about her blog screams luxury to me! She mainly posts beauty reviews but has recently introduced some lifestyle through her Sunday Edit posts, which I really enjoy reading. I don't think that there is another blogger out there with more beautiful photo props! The lovely Anne writes Linda Libra Loca. She is my go-to person for in depth skincare reviews - you will not find a more detailed review anywhere else and coming from a medical/scientific background, this lady knows her stuff. Although we have different skin types, we have some products in common and I absolutely love watching her videos because I get to see some more of her (very funny) personality. She never fails to make me laugh! Jen from Vibrant Beauty Blog is my lipstick guru - I doubt there is a shade that she doesn't own! She is fearless in her makeup choices and is lucky because every colour seems to suit her so she can be Vibrant, Vivacious and Veracious! She always seems so positive and upbeat in her posts and has the biggest smile I have ever seen. If you want to keep up to date with the latest makeup releases, go follow her! I am always in awe of Dagmara's creativity on Mummys Beauty Corner. She manages to use 4/5 eyeshadows to create a stunning eye look, whereas I get slightly panicky if I use 3!! Her looks are so varied, yet always flawless and polished. She also posts regular, in depth skincare reviews and is a fellow palette addict! Mammaful Zo is a blog that I only discovered earlier this year but it fast became a favourite. The very lovely, warm and friendly Zoe writes about all things beauty - skin, hair, makeup, nails & fashion too! She is always so upbeat in her posts, which is testament to her character given how ill she is, yet you would never know. I never miss a post! 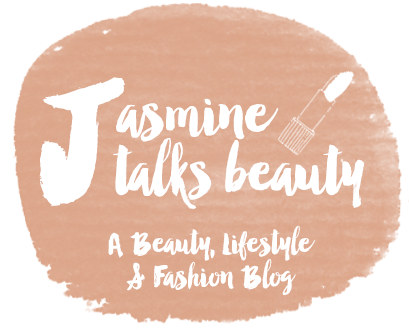 Finally, I had to include Jasmine Talks Beauty. Jasmine's blog is jam-packed with makeup and skincare reviews and swatches, but also lifestyle and travel. Jasmine has travelled a lot this year and documents every aspect of her trips so well that you feel like you've been on the trip with her. I love the honesty in her reviews and her photos are always beautiful with plenty of swatches (something I haven't mastered very well myself!). In terms of youtube, I really love Nishi V, Fashionmumblr, XameliaX, Chloe Boucher, Life With Sharon, Tati, Kate La Vie and Beauty Life Michelle amongst many others! Do you follow these blogs?! I would love to hear who your favourite bloggers are! Please tell me in the comments below! This is my last post this side of Christmas - I will be back on the 28th with a "What I Got for Christmas" post. I hope you all enjoy the festive break with your loved ones. Thank you for reading, commenting and supporting my blog throughout 2016 - I really appreciate it. Happy Christmas!